Weak Binding Agent is a Blood Magic Alchemy reagent. It is used to adding single effect for Potion Flasks. Several effects can be added for one potion, but the more effects a potion has the less chance of success. And in case of failure, the potion will explode. 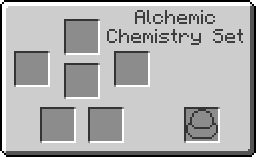 Chances of success are calculated by the formulas: 0,4^X, where X is the number of potion effects before adding a new one. This is an example recipe. You can use another reagent instead Blaze Powder. See the list of possible reagents on Potion Flask page. Add effect Strength I (2:00). The chance to successfully add an effect depends on the number of effects that the potion already has. In case of failure, Potion Flask will explode. This page was last modified on 14 December 2018, at 06:51.